Personalised Desk Pads. Desk Pads UK Printed And Made To Order. Give your working area a makeover with personalised desk pads. Not only do these desk pads look great, but they will provide your hands and wrists with all the comfort and support they need during a busy working day at the computer. Made from durable yet flexible 3 mm neoprene, you can print your favourite photos all over your pad, allowing you to take a piece of home with you to work. Large enough to hold all of your computing essentials, such as your mouse, stylus and tablet, this pad will help change the way you work. Your photo desk pad is handmade to the highest standards at the Bags of Love studio in London. Made from our strong and soft 3 mm neoprene fabric, these handy desk pads will add colour, personality and functionality to your desk. The generous size means it can comfortably fit all of your computer essentials, while the pointer precision reliability of the fabric will give your mouse a smooth experience when in use. The print quality of your mat is brilliant; colours are punchy and bold and details are crystal clear. Upload whatever design you like onto your desk pads, UK made and create a workstation that will inspire you to be creative and productive. Who Would Love Personalised Desk Pads? Anyone who finds themselves in front of a computer all day would truly appreciate their own photo desk pad. They are especially useful for graphic designers or anyone who uses a lot of equipment with their computers, such as a tablet, stylus and notebook. Thanks to their protective and durable nature, they are also great at keeping your dining or kitchen table safe from hot dishes, marks and scratches. Use them instead of or underneath a tablecloth. To make homework more fun for your little ones, why not make them their very own homework pad? You can print images and designs that they love to encourage them to sit and do their homework nicely - although we can't guarantee they will! We expertly make your pad to order in our London studios. Our team of skilled technicians use specialist methods to infuse the ink deep into the fibres of the 3mm neoprene fabric. This creates a long-lasting print that will not rub off or scratch away, and the colours and details will look sharp, vibrant and bold. Once your photos are printed onto the pad, our crafters cut it to size before applying the non-stick backing. Your desk pad is then all ready to be delivered straight to your door. Your photos or designs are printed edge to edge on the mat, but you could also incorporate a stylish border to complement your photos and the existing decor of your home or office space. This is simple to do using our design interface. Simply adjust your image size and select the perfect background colour. This will become the border, surrounding your original design. You could even add text to complete your pad. There are so many ways you can design your pad to make it personal to you. 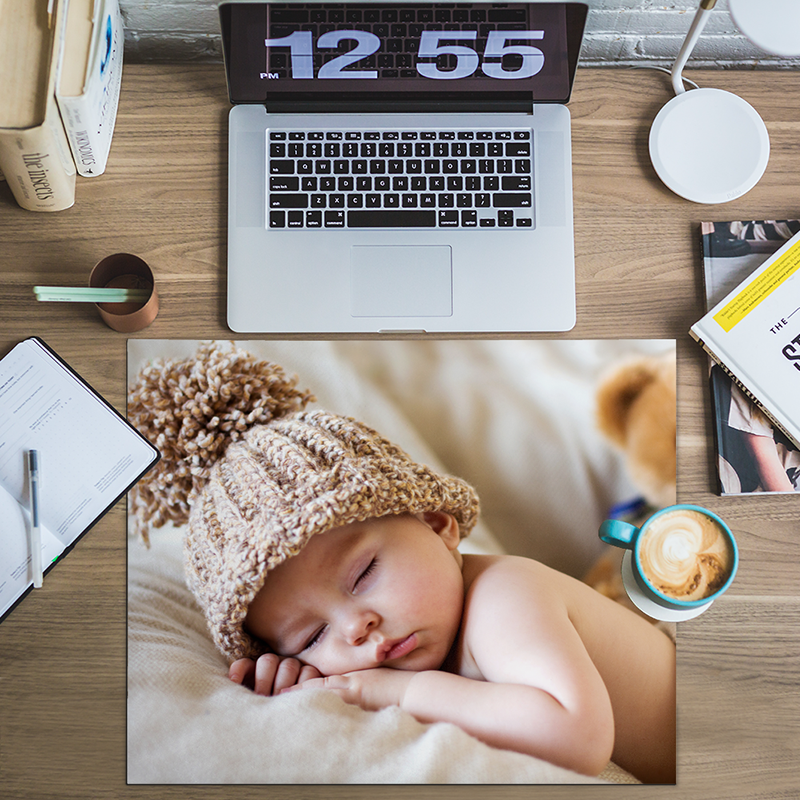 If you work in an office all day, then why not create a photo montage using your favourite photos of your family? It's a lovely way to take a piece of home with you and their smiling faces will keep you company and inspire you to do your best work. If you have children, you could create a personalised pad just for them. These are ideal to use during arts and crafts time and will help encourage them to keep their art supplies in one area. Create a design using their previous masterpieces, and add their name and photo so they can enjoy getting creative in an exciting new way.